It seems like it was only an unfortunate matter of time before another party stepped forward with their thoughts on the altercation between Russell Crowe and Azealia Banks. Today, RZA—a friend of Crowe’s and the one who brought Banks to the party—took to Facebook to explain his history with Banks as well as his version of events. In a detailed post, the rapper and producer takes a rather paternalistic and condescending tone, outlining the apparent many good deeds he’s done for Banks before blaming her squarely for the altercation. In all caps, he asserts: “THIS IS NOT A RACE OR GENDER ISSUE,” and that he never hard Crowe direct a racial slur at Banks. 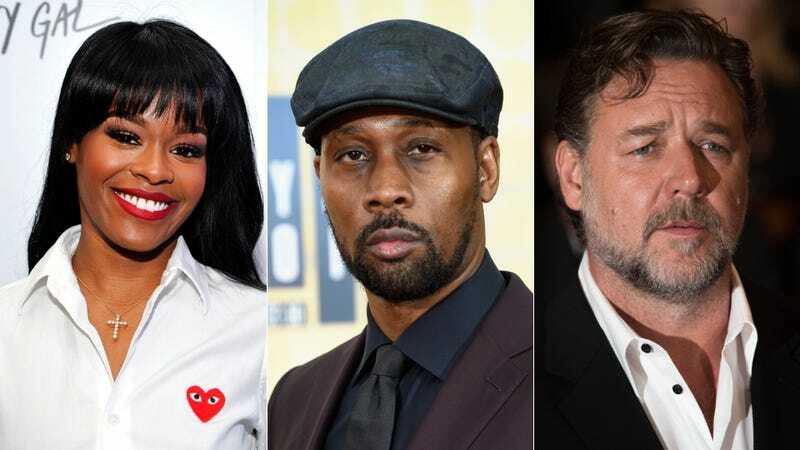 While he’s entitled to feel how he likes, Azealia Banks is none of those things to RZA and it’s doubtful she needed or asked for his protection or his prayers. At this point, all I can really do is continue to echo the general sentiments I’ve seen about the incident, which is that neither party is likely completely blameless and I hope it’s resolved amicably. Banks certainly has a history of terrible behavior, but I also have a hard time trusting anyone who would voluntarily be friends with Russell Crowe. On Monday, Banks filed a police report against Crowe. Normally I don’t respond to negative social media attacks towards me. Yet in this case of Azealia Banks I’m compelled to respond. Firstly I only wish the best for her and any struggling artist in this complex industry. A few weeks ago Azealia hit me up for some economic help and bong I gave a helping hand. She then followed up asking me to help her get a record deal. I called a friend and bong a record deal was on the table. The only clause my buddy gave was I be the filter because the word is “she is volatile”. I called her and told her a deal was in the workings. She immediately, prematurely went to social media and claimed she signed a deal with RZA Yet no deal was signed. I didn’t respond or comment to her post because I’m not the type to stop the hustle. I actually wanted her to win. I advised her to stay focus, leave social media and tabloids alone and let your music and art do your talking. She then hits me for a ticket to LA to work and Bong I comply. She then needs a place to stay and bong I put her in a hotel. I returned to LA shortly after and we scheduled a meeting. I invited her to meet me at the BHH Polo Lounge. Yet I head also planned on spending some time with my Buddy RC in his suite so I ask him can she join. He says “cool Bobby” so I invited her. Before the night is over Azealia is insulting half the room she becomes loud and obnoxious. There was nothing funny about her behavior. I felt a little embarrassed because she was my guest. Azealia threaten to cut a girl in the face with a glass, then actually grabs a glass and physically attacks for no logical reason. Russell blocked the attack and expelled her from the suite. Seeing is believing and I saw her behave as an obnoxious erratic individual and in the circles I frequent this was unprecedented. I was totally puzzles by her and thought maybe meds or booze or something had her zoned out. Nevertheless I made sure she got home safe. THIS IS NOT A RACE OR GENDER ISSUE. I’m not trying to protect Russell from anything he is a man of his own Caliber. My art, talent and success speaks for it self and Azealia’s recent slander of me and self victimization reflect’s the personality of the person that was in that room that night. I have a wife, daughters, sisters and females on my staff so I protect women everyday. I pray none of them ever behave the way I witnessed Azealia Banks behaved that night.